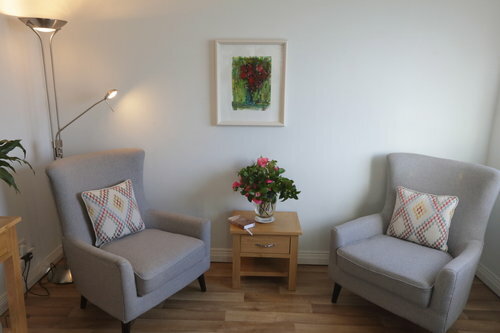 Cork ARC in Bantry is open on Tuesdays and Thursdays where cancer patients, their families and carers are warmly welcomed and have a space to feel at ease. For many years patients and relatives in West Cork have been travelling to Cork for our services. Cork ARC in Bantry takes away this long journey. Living in West Cork brings specific challenges for cancer patients, rural isolation, large distances and issues of transportation being important ones. Cancer Connect provides support by transporting people from all over West Cork to our centre in Bantry. The drop in centre is the focus of the house. Visitors may drop in without an appointment and will be met by one of our trained volunteer listeners in a relaxed atmosphere. Booking is essential for all complementary therapies, groups and information sessions, except for the ‘Hour of Calm’ which is a drop in group. This is a drop-in group session led by experienced facilitators, offering techniques of progressive relaxation, breath work, meditation, visualization and mindfulness which invite you into a space of peace, rest and calm. Commencing on Thursday 7th March, for six weeks. Join Cork ARC for a series of six planned walks in the beautiful West Cork countryside. Commencing Friday 26th April, 10.30 am, for six weeks. Commencing Tuesday 30th April, 11.00 am, for six weeks. Friday 10th May, 7.00 - 8.30 pm at the Beara Coast Hotel, Castletownbere. Monday 20th May, 7.00 - 9.00 pm at the Maritime Hotel, Bantry. Associated information sessions include our Lymphoedema and also our Hormone Therapies information mornings in Cork city. The Cork ARC service in West Cork has been generously assisted by Bantry Hospice and we would like to thank them for their contribution. We are also very grateful to the people of West Cork and South Kerry, whether based at home or away, for their continued generosity in helping Cork ARC's service in Bantry continue to provide such an invaluable support to all those affected by a cancer diagnosis. If you would like to contribute to our work in any way, you are very welcome to do so, and know that all funds donated will directly benefit the services of the Cork ARC Cancer Support House in Bantry.